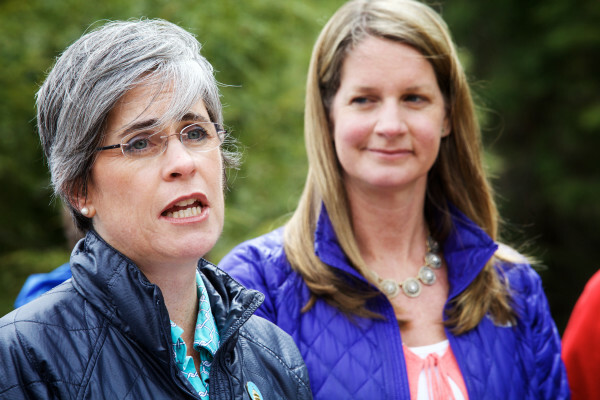 Penney Asherman (right) of the Chebeague and Cumberland Land Trust listens to Sen. Cathy Breen, D-Falmouth, speak at a press conference on April 27 at Knight's Pond in Cumberland. AUGUSTA, Maine — Gov. Paul LePage’s blockage of voter-approved bonds, which he has used several times during his tenure in attempts to force his will on the Legislature, received significant pushback Thursday when the Senate voted 26-9 and the House voted 102-48 for a bill that would force him to release the bonds. Both votes exceeded the two-thirds threshold, which, if they hold, would be enough to override a veto by LePage, though the House barely reached that number. LD 1378, sponsored by Republican Sen. Roger Katz of Augusta, proposed the measure because, as he has said, a Maine governor has never tried to block the sale of voter-approved bonds. At issue currently is LePage’s refusal to release $11.5 million in Land for Maine’s Future bonds that were endorsed by voters in 2010 and 2012. Those bonds would leverage tens of millions in additional funding from the private sector for 30 projects in 15 of 16 Maine counties. Democratic Sen. Cathy Breen of Falmouth said the bond funding is part of a contract on which the governor is now reneging. Sen. Nate Libby, D-Lewiston, said the Legislature approved the bonds by two-thirds votes before they went to referendum. “[LePage] can veto upon approval from the Legislature but once the people of Maine have spoken, that should be the final word,” said Libby. During a State House news conference earlier in the day, land conservation supporters attempted to pressure LePage into releasing the bonds. Tim Glidden, president of Maine Coast Heritage Trust and former director of the Land for Maine’s Future program, said LePage’s action is single-handedly sabotaging millions of dollars of private investment in local communities. “If he chooses to remain on this course, blocking all of the voter-approved Land for Maine’s Future bonds, which total about $11.5 million, the state would lose more than $30 million in additional investments,” said Glidden. In the House, which took up the measure Thursday afternoon, arguments were more clearly split on party lines. Assistant House Minority Leader Ellie Espling, R-New Gloucester, urged opposition to the bill because it would undo what she considers an important check and balance in the government process. Rep. Mick Devin, D-Newcastle, said the will of the voters is sacred. “The strongest voice in the issues affecting Maine is the approval of a statewide referendum by the citizens of Maine,” he said.